Twenty-one Britons have been identified as victims, with nine more believed to among the dead, Downing Street said. 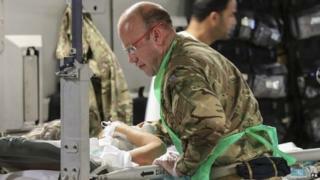 All the seriously injured have now left Tunisia and those killed will begin to be repatriated on Wednesday, it added. Tunisian authorities have arrested several people on suspicion of helping the gunman, who had links to the jihadist group Islamic State (IS). Downing Street has ruled out a British inquiry into the attack, saying British police would assist the Tunisian investigation. There is currently a team of 27 people in Tunisia, from the Foreign Office, the Ministry of Defence and the police. The four injured Britons returned on a specially modified RAF C17 transport plane which had left Brize Norton in Oxfordshire for Tunisia on Monday afternoon. The Ministry of Defence said the plane had flown into Birmingham Airport, where one patient was taken off, before it continued to Brize Norton. A spokesman for Queen Elizabeth Hospital in Birmingham said the patient arrived at 00:45 BST. Professor Sir Keith Porter, a senior surgeon at the hospital, said: "I can say at this stage that the patient has life-changing and life-threatening injuries. We hope to release more information about the patient later." The other injured patients are being treated at John Radcliffe Hospital in Oxford, Derriford Hospital in Plymouth and London's St Mary's Hospital, said Downing Street. In a speech to the Commons on Monday, following a minute's silence held by MPs, Prime Minister David Cameron described the attack as "brutal and sickening". Also on Monday, Home Secretary Theresa May laid flowers on the beach near Sousse where gunman Seifeddine Rezgui shot people near the Imperial Marhaba and Bellevue hotels. Tunisian authorities have said they believe the 23-year-old student - who was shot dead by police - acted alone, but had help planning the attack. Local media reports suggest one of those detained is a flatmate of Rezgui. British holidaymaker Steve Johnson contradicted the police's account, telling the BBC he saw a second gunman. Tributes are continuing to be paid to the British victims, who include three generations of the same family and a husband who died trying to shield his wife. But former Birmingham City footballer Denis Thwaites and his partner Elaine are among the latest fatalities to have emerged. The BBC understands the couple, from Lancashire, were staying at the Hotel Riu Imperial Marhaba when the attack took place. Three Irish people, one Belgian and one German are also thought to be among the 38 people who died. At least 36 people were injured.